The iPhone X is considered Apple’s biggest design change for its flagship smartphones since the original was introduced ten years earlier. From the beginning, Apple’s goal was to create an iPhone that is entirely screen so that it would provide an immersive experience. The iPhone X also responds to your touch, your voice, and your face. 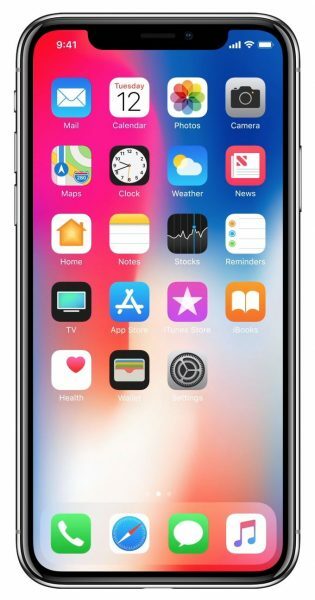 The edge-to-edge OLED display distinguishes the iPhone X from all the previous generations of Apple’s flagship smartphones. And the display on the iPhone X makes all of the colors visually stunning as it has true blacks, supports high brightness, and comes with a 1,000,000 to 1 contrast ratio. This is one of the biggest pros. Known as Face ID, the facial recognition feature provides secure authentication as you unlock your iPhone X and pay with Apple Pay. Face ID is powered by the TrueDepth camera on the front-facing camera and it is relatively easy to set it up. Face ID analyzes over 30,000 invisible dots to create a depth map of your face, which ensures accuracy and prevents identity theft. The iPhone X supports Portrait Mode on the front and back. The front-facing camera is 8 megapixels so it can take sharp Portrait Mode Selfies with sharp foregrounds and artistically blurred backgrounds. And the 12-megapixel rear-facing wide-angle and telephoto cameras support a feature called Portrait Lighting, which brings studio-quality lighting effects to your photos. The portraits I have seen taken with an iPhone X are incredible. Inside of the iPhone X is an A11 Bionic chip with 64-bit architecture, an embedded M11 motion coprocessor, and a neural engine. This processing power substantially increases the speed of the devices so opening apps and is a flash. You will especially notice how buttery smooth the gaming experience is with the iPhone X. With the Face ID facial recognition feature, the iPhone X allows you to record 3D animated emoji known as Animoji. There are only a few Animoji available, but Apple plans to continuously add more in the future. When iOS 12 releases in September 2018, you will be able to customize Animoji so that it resembles your appearance  which is known as Memoji. And Animoji and Memoji will be able to detect winks and tongues with iOS 12 as well. When Apple announced the iPhone X, iPhone 8, and iPhone 8 Plus in September 2017, one of the highlights was wireless charging. These devices were the first of Apples flagship smartphones to support wireless charging and they are Qi compatible. And fortunately, there were a number of Qi wireless chargers that were already available in the market when Apple revealed wireless charging would be supported on its newest devices. The iPhone X has an IP67 rating. This means that the iPhone X is completely protected from dust. And it can withstand water submersion up to one meter (3.3 feet) for 30 minutes. This means you can rest assured that your iPhone X will continue to work even if you use it in the shower and you use it in a swimming pool. One of the biggest complaints about the iPhone X was the price. The MSRP of the iPhone X ranged from $999 for 64GB storage to $1,149 for 256GB storage. This made the iPhone X one of the most expensive smartphones of 2018. The iPhone X supports fast charging, meaning you can get 50% power after 30 minutes of charging if your battery. But you will need extra accessories to make it happen. Plus the iPhone X will have to be connected to USB-C and you will need a USB-C to Lightning cable and a USB-C Power Adapter. Apple sells a USB-C to Lightning Cable for $19 and a USB-C Power Adapter for $49. So fast charging does not come cheap. The dimensions of the iPhone X are 5.65 x 2.79 x 0.30 inches. Based on this size, it can feel pretty big in the pants of your pocket. And in many cases, you may have a hard time actually getting it to fit in the pocket of your pants. Plus it may also have a hard time fitting in your wallets and wristlets. So this may cause many people to look for specific sizes of apparel with larger pockets or accessories to support the larger sized device. The iPhone X definitely lacks in color options. It is only available in Silver and Space Gray. Some of the color options that Apple offered for its previous devices included silver, gold, rose gold, black, and jet black. The notch of the iPhone X may feel strange to many people. As you play games and watch videos, it feels strange to have a section missing. And it takes time to get used to swiping down from the left of the notch to see the Notification Center and the right of the notch to see the Control Center. When the Apple released the iPhone X, developers also had to scramble to make their apps workaround the notch. As a result, a number of apps were not updated to support the notch so they may seem buggy. Interestingly, a number of Android manufacturers have decided to build devices with notches as well. This includes devices built by LG, OnePlus, and Huawei.